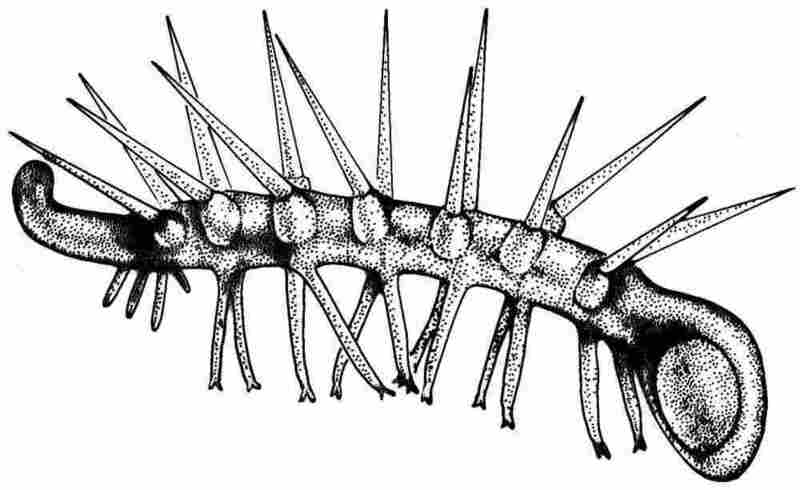 Cactus Walking On 20 Legs Found In China : Krulwich Wonders... A recently unearthed fossil of a blob-like creature could be the ancestor of crustaceans, and may have introduced the notion of jointed legs. 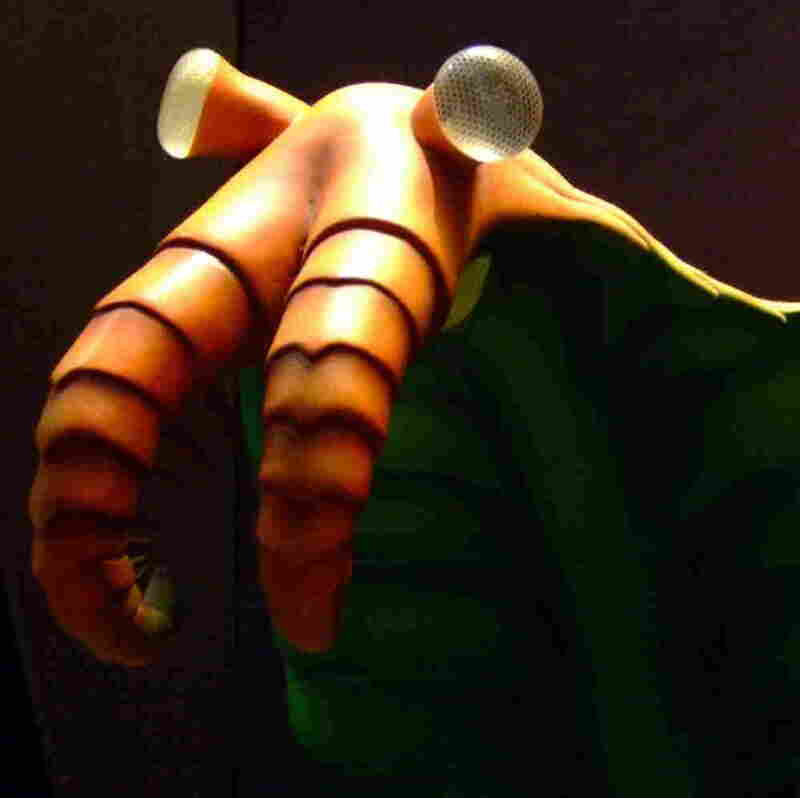 There was a wild period — roughly 520 million years ago — when life, for no obvious reason, burst into a crazy display of weird new fantastic forms — producing creatures in shapes never seen before or since. 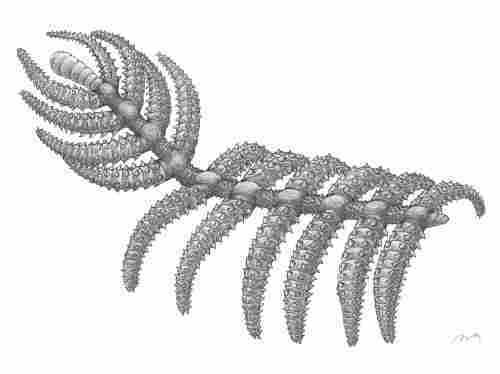 Consider this animal, the newest fossil discovery from Jianni Liu in China. She calls it "the walking cactus." This is not a plant, not a sculpture. It was a live animal, with no eyes, what may or may not be a head, mostly a gaggle of limbs, armor-plated, covered in thorns, attached to a stomach. Jianni Liu has found three well-preserved walking cactus fossils, but previously discovered lobopodians are even weirder. Hallucigeni, so named because of its "bizarre and dreamlike quality" (said the scientist who described it) is another walking worm that has what looks like a head-like blob on one side, but with no mouth, no eyes, no sensory organs, so it probably isn't a head. But no one is sure, because the lobopodians are so ancient and in many ways so peculiar they may not be directly related to anything we meet or eat today. All we know, says Richard Fortey in his classic history Life, is that a long time ago, the first of these strange animals popped into view and for a short while "there was a chain reaction, unstoppable once it started, a bacchanalia of zoological inventiveness, which has never been matched again." Every living thing on earth today is what's left over from that amazing burst of forms. It's true we now live on land and in the air, not just in the sea. We have grasses and flowers and beetles in more varieties than you can imagine, and yet, in some deep architectural way, the developmental paths were set way back then, 500 million years ago. The Walking Cactus is just another souvenir of that crazy moment. Thanks to Ed Yong and his blog, "Not Exactly Rocket Science," for exploring the connections between the Walking Cactus and modern arthropods. Richard Fortey, in turn, explores why life forms suddenly blossomed back in the Cambrian in his classic book, Life, A Natural History of the First Four Billion Years of Life on Earth (Vintage, 1997) .